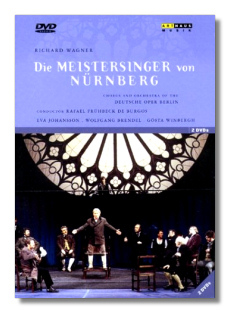 At 266 minutes this is a fairly brisk Meistersinger, quite in the tempo range of the lean Sir Georg Solti, who made two excellent recordings of this operatic masterpiece, both benchmarks of sorts. Rafael Frühbeck de Burgos, in his own right, manages to conduct this massive work with a sense of urgency, a sense for Wagner's lighter expressive character, his sometimes grudging but still effective comic manner. Most of the principles are convincing, especially Wolfgang Brendel, whose Hans Sachs is one of the better efforts in any recorded venue. Eva Johansson's Eva is also quite convincing, but Gösta Windbergh's Walther can be stiff at times: try the Third Act climactic number Morgenlich leuchtend in rosigem Schein, where in the closing moments he becomes overwrought and somewhat wooden in his delivery. That said, he is generally quite pleasing in this opera otherwise and thus convincing in the role of Walther. Eike Wilm Schulte's Beckmesser is also impressive, as is most of the cast here. The production is first rate too, from the sets and camera work to the sound reproduction, which is vivid though not up to the standards of the finest efforts today. That minor sonic drawback is understandable since this performance was taped at the Deutsche Oper Berlin in 1995. In the end, this will serve most listeners as a fine, perhaps even great Meistersinger, although I must give precedence to the two Solti efforts, even if they come from the pre-DVD world of sound only.